With the advent of powerful and advanced desktop hardware, 64 bit operating systems, and robust back-end file servers and data warehouse storage servers, GIS, a “Graphic Information System” linked to a relational database, and AutoCADD, the electronic design, drafting and 3D modeling software, have come to the forefront as the primary technology and software tools for creating, maintaining, and performing analysis on parcel & site map land based records, maps, and associated land assets and attributes. GIS technology gives professionals the tools to develop geodetic data that is compliant and provides the survey, mapping and data analysis disciplines access to control data derived by state, federal, local and tribal governments, and private companies. Geodetic control can be used for a variety of public and private imagery, mapping, survey, and construction projects, and also supports spatial accuracy improvement for national mapping frameworks. 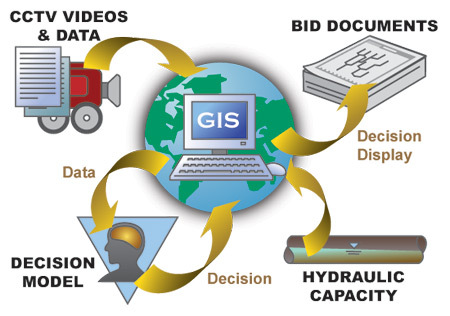 For general record and mapping purposes, as well as the performance of various types of analysis, a GIS system, with it’s associated tabular data, physical map data sets, and the relevant software analytical tools, enable data analysts to perform spatial analysis, route planning analysis, combined asset and attribute analysis, and run diverse database queries and perform data set analysis that can subsequently be represented graphically in map and chart form, as well as published in more traditional report form. 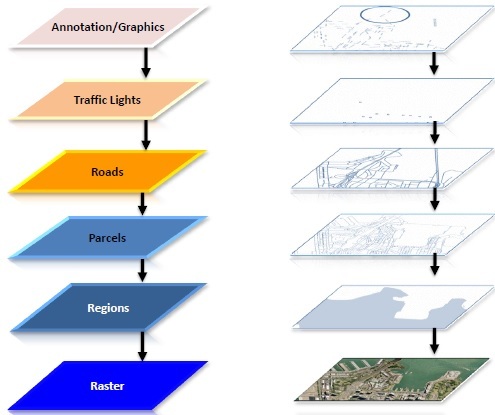 Using Autocad design and drafting software, the base map layer is created containing civil engineering, architectural and physical land survey data sets, and any additional relevant graphic data, and imported into the GIS in preparation for data importation, or new data in-put, of tabular information data sets. Measurements, survey points and associated point data, and computations are all managed and stored in a GIS system. Raw survey data, COGO measurements, and field sketches can also be entered directly into the GIS. Because accurate survey measurements establish the legal definition of a parcel, this capability is essential to the accuracy of land records and assessment data. As new, more accurate data is collected, GIS has the capability to adjust existing data to conform to new survey measurements while preserving the historical and spatial integrity of the land records geodatabase. The entire layered information set, linked to the relational database tables and records, with their associated attributes, is then used to develop a complete spatial, physical characteristics and attribute data model ready for analysis, reporting, and eventual printing and/or publishing.